July 5 Saturday Pleasant, not quite as warm. Feeling pretty well self, all tired & sleepy. Met Ellery this morn, first time since yesterday A.M. Anna at (?) awhile not home till after 2 o,c, Lena out till 5 o,c, (same as Ellery) here to breakfast & part A.M. Taking all easy as can, in to see Rose in A.M. & again in P.M. also in to Mrs Howe's in P.M. of errand. I went with Ellery & had supper at armory, spent eve at home. 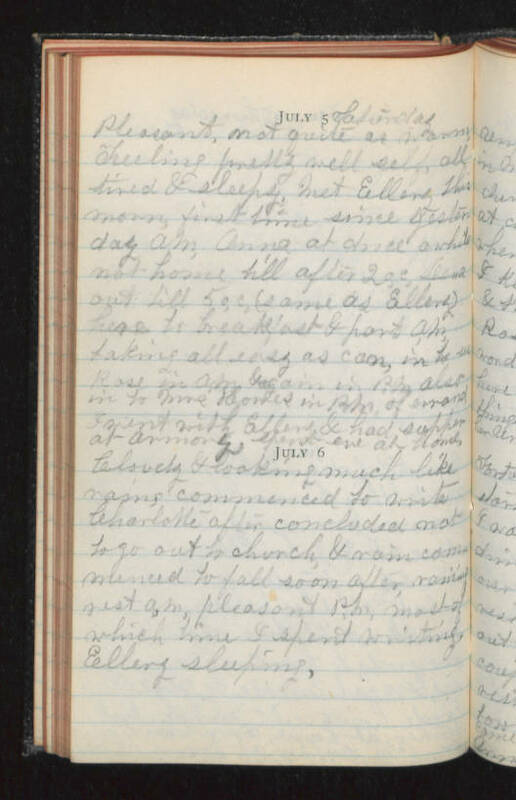 July 6 Cloudy & looking much like rain, commenced to write Charlotte after concluded not to go out to church, & rain commenced to fall soon after, raining rest of A.M. pleasant P.M. most of which time I spent writing, Ellery sleeping.